I was thinking about Ralf Schumacher today, about how disastrous this season has been for him and how it may be his last. Although I have made the occasional joke about his poor performances of late, I do admit that much of it has been caused by a run of really awful luck. When that happens, it is easy to become desperate and to start making mistakes as a result. That appears to be what happened to Ralf this year. 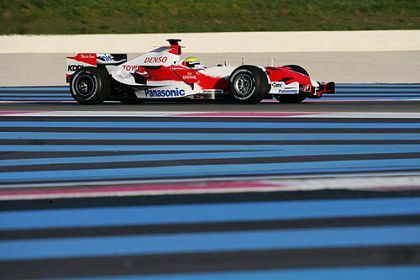 He was certainly not as bad in 2006 and, in spite of his continual optimism in the face of the press, he must have been aware of how his stock was dropping as he failed in race after race this season. How the mighty are fallen. For we once expected him to be mighty, you know. He came into F1 with his brother's legend already beginning to flourish and it was natural that we should watch to see if he showed evidence of the same talent. And there were occasional flashes of speed that seemed to augur well - to the extent that it was years before we could decide once and for all that he was not Mickey Mk II. The mistakes should have told us differently, I suppose, as well as his talent for being in the wrong team at the wrong time. But the hope remained as his brother established his reputation as the foremost driver of his time. We were desperate for someone, anyone, to knock Michael off his perch and, after Frentzen fizzled and Hakkinen retired, there seemed to be only Ralf who might suddenly come good and make a competition of it. So we made Ralf's excuses for him and continued to hope. It never happened, of course. The plain, hard truth was that Michael took the lion's share of the talent going in the Schumacher family by being born first; Ralf got what was left over. And it was not just driving ability that Mickey hogged - he took also the icy determination, the ability to make the team work for you, the will to win at all costs. Poor Ralf was left as the nicer guy but without a chance of equalling his brother's achievements. In so doing, he illustrates a principle that, whilst not always true, holds good in most cases: the older son is the achiever, the younger the rebel. A part of this is nurture-based - scientists maintain that first born children are more intelligent and stable than their younger siblings, perhaps because they receive all that is on offer in their early years, whereas later additions must share. Then there is the tradition that the eldest son inherits the estate whereas younger sons must earn their way in the world; thus inducing a certain smug confidence in the older and and a rebellious attitude towards authority in the younger. The Schumacher brothers certainly confirm the theory but others from the past are less conclusive. Of the Rodriguez brothers, Ricardo was killed too early after showing great promise but the older Pedro went on to become one of the quickest drivers in F1, especially in the wet. The elder Fittipaldi brother, Wilson, did not show quite the same talent as Emerson, and decided that his skills lay in team management rather than driving. But Teo Fabi had a long and successful career in both F1 and CART racing, whereas his younger brother, Corrado, disappeared after a couple of years in Osellas and Brabhams. Whatever the truth, it seems that Ralf's career is as good as over. He insists that he will still be on the grid in 2008 but, even if that is so, it must surely be in one of the slower teams that might benefit from his experience. Judging by the Toyota years, however, they had better not rely too much on Ralf's car development skills. It's a sad tale and I can no longer take part in the sport of Ralf-knocking. He disappointed us, yes, but our expectations were too high from the outset. Toyota proved his undoing in the end after seeming such a good idea in the beginning - there was a time when we all expected great things from the Japanese giant too. Perhaps Ralf should take the opportunity to retire quietly from the sport at this juncture. He has made enough money to be more than comfortable and the release from the pressure of competing against his brother's legend must open a whole new life for him. Michael seems to be enjoying his undefined role as a spare part to the Ferrari organization - perhaps Ralf can show that he knows even better how to relax and spend his fortune. Almost without exception in the history of F1 the younger brother has been more successful. This was repeated by every writer of note when Ralf was in Japan and the belief was that the Schumacher's would folow that pattern. I can think only of the Fittipaldis, Steven. Enlighten me. Intriguing topic, so much so that I did a little research and found that two other champions, Jackie Stewart and Jody Scheckter, have also had brothers who have competed in Formula One. Jimmy Stewart, Jackie's elder brother, competed in a single race in 1953. Ian Scheckter, also an elder brother, competed in 20 races (1974-77), but failed to score a single point. But other than the Rodriguez brothers and the drivers already mentioned, I'm not aware of any other sibling pairs who have made it to F1. You do astound me at times. This brought a tear to my eye. How cruel the injustice of being the younger child. But what about the Brambillas? Ever since I started hearing about them I've been wanting someone to write the book. I was aware of Jody's elder brother, Ian, but he didn't occur to me when writing this, Eric. But if I ever knew about Jackie's brother, I have well and truly forgotten him. Judging by their records, however, they blow the theory of elder brothers apart, at least as far as F1 is concerned! It is amazing how often it applies in life, however - just think of all the brothers you have known and the differences in character between elder and younger. "however, they blow the theory of elder brothers apart"
I'm 3 years senior to my brother and beat him regularly. Does that count? This is a good one Clive........it's off season, we've got little to do while awaiting word from Mr. Alonso and we end up with this. How about fathers and sons? I think the other Brambilla was Tino. And since you brought up Pedro Rodriguez, one of the stories I heard was that Tino injured himself when he fell off a scooter doing a lap at ---somewhere, so on qualifying day Pedro did Tino's quali for him...like I said, it's just a story I heard, I have no idea if it's true. But these guys were colourful. I'm not sure if Tino even actually competed in F1 or if he may have just tried to qualify a few times. Your memory is vindicated, Verasaki - extracted from the Autocourse Archives: "Tino Brambilla - elder brother of Vittorio and a notoriously hard racer who had some success with F2 Ferraris. Two failed attempts to qualify for the Italian GP, the second occasion being in 1969 when entered in a works Ferrari. Unfortunately he damaged his ribs when he crashed his scooter on a pre-event recce lap, so he persuaded Pedro Rodriguez to wear his overalls and helmet in order to qualify the car on his behalf. The masquerading Mexican duly obliged, but come race day Tino was still in too much pain and was forced to withdraw..."
Absolutely correct on all counts! I love stories that illustrate what characters abounded in F1 in those days and that one is a classic. The Pitlane forum which sadly no longer exists discussed the topic about a year ago. We came up with 10 to 12 sets of brothers who had raced in the world championship. The younger brother in the majority of cases had the better results. This is not uncommon in sport. My belief (as an older brother) is that the younger brothers grow up competing with the older brother and are therefore always stretching to that standard. A book about the Brambillas would be well worth reading. There is a famous story told by Vittorio about an incident in testing. Tino broke down and his mechanic went out to see if he could help. Having repaired the car he was about to walk back when Tino told him to climb on the back of the car and he would take it easy on the way back to the pits. When Tino arrived Vittorio asked where the mechanic was. Tino told him he had forgotten he was on the back and had driven most of the lap at full speed. Needless to say the mechanic was a bit beaten up when they found him although fortunately suffered no serious injuries. Jackie Stewart's brother Jimmy was a successful sportscar racer and the inspiration for Jackie to race. No-one has mentioned Vittorio's nickname yet and it seems quite appropriate considering Kimi Raikkonen's party-going habits this year - he was known as the Monza Gorilla and I'll bet there's a story behind that too. I have given this some thought and done a little digging. As far as I can find/remember the following is the list of brothers who have raced in at least one world championship GP although I am still sure I am missing a couple. That looks a pretty comprehensive list to me, Steven. But it's tiredness at the end of the research that made you miss Gilles and Jacques - father and son, not brothers. I'm surprised that both Brabham brothers had a drive in a GP - I know David did but Gary...? Ah well, must have been while I wasn't looking. Gary Brabham did maybe one season. It always surpised me that the oldest brother Jeff never raced F1. How can you be the son of a triple champion and not get a single race? Considering how many sons of former F1 stars are driving in F1 or about to at the moment, it does seem strange that no-one ever tried Jeff. Maybe it was because there were fewer seats available each year in those days - drivers tended to stay with a team for a long time before moving on. I don't think it was so much the seats (there were huge numbers of seats then, and the backmarkers chopped and changed their drivers a lot) as the fact that most of the ones that were vacant at a given time needed money. Lots of it. Jeff Brabham was probably one of many drivers over the ages who have owed their non-participation in F1 to younger and better-backed drivers. That in Jeff's case some of them were his younger brothers probably made it more galling. Schumacher Michael and Ralf - 1-0 to the older brother. Fittipaldi Wilson and Emerson - 1-1. Scheckter Ian and Jody - 1-2. Brambilla Ernesto(Tino) and Vittorio - 1-5. Rodriguez Pedro and Ricardo - 2-5 (although Pedro got his debut first, he was in fact the younger Rodruigez). Fabi Teo and Corrado - 3-5. Whitehead Peter and Graham (half-brothers) - 4-5. Winkelhock Manfred and Joachim - 5-5. Villeneuve Jacques and Gilles - 5-6. So the decision is in favour of the younger brother - but only a magazine desperate for a headline would take this to be conclusive, given the small margin. Turns out Uncle Jacques was younger than Gilles although like his brother he seems to have lied about his age. Gilles told everyone he was born in 1952 so that F1 teams would think he was younger than he really was. He was born in 1950. Jacques was born either in 1953 or 1955 depending where you look. Details of his brief F1 career can be found at. So the net result is... inconclusive! Although the theory obviously doesn't hold true in our necessarily small sample from F1, scientists have looked at the differences between older and younger brothers and I was merely repeating the results of a particular study I read years ago. Interestingly, they have also looked at the effects of being an only child - which I then extended to muse upon the future awaiting China in view of its one child per family policy. It's in my personal blog at this address, if anyone wants to know (well, a little self promotion never hurt anyone). That's what I love about F1 fans - can you imagine a conversation between football fans taking such twists and turns? Well, how good it would be if all this talking of the elder brothers beeing the better ones were true on me. I have to admit that i have gotten the most from my mother and her father, atleast when it comes to kilos and determination. There's not one person i know of whose more stubborn than this person sitting here behind this desk. I'm the only one i our family who have gone through almost as many cars as the years i have had the drivinglicense. The only upside here, is that i have never got caught by the police. Mostly, probably, because of luck. On the other hand, looking in to the racing legends, your issue might be true. I'm not one to have that good control of the historics of racing and the participants from certain familys. But the post was good reading, correct or not. What do you say Mad? Is what your father say, what you feel is true? Or are you maybe the only son, so there's no one who can compete with you? Seriously I don't know. Pooties very good at some things and I good at other things.